Spring. Its absolutely beautiful here when the cherry blossoms and tulips are in bloom and everything is green and lush. Fall in the Shenandoah Mountains. Spectacular show of reds, yellows, and oranges is nature’s October show here and definitely worth the drive every year. Washington Capitals. Even though they got swept in the 2nd round, I’m still a fan. I’m definitely going to miss watching Ovechkin play live. And I’m seriously going to miss Rocking the Red at the Caps games. “Unleash the Fury” boys! Virginia wine and the gorgeous vineyards. Many an afternoon has been spent sipping wine at the vineyards overlooking the mountains or countryside. Of course they were always spent with wonderful companions which made them all the more special. Being close enough to drive to my parents, brother, grandfather and other relatives. I’ve been very lucky to have my brother 30 minutes away and my parents 2 1/2 hours away for so many years. Plus I can drive to every close relative in under 6 hours. I’m not sure we’ll all ever be so close in proximity again so now visits will be less frequent and require more planning. Berries. Yes, I know that’s a bizarre thing to list but I love, love, love blueberries (and all the other berries) and OMG do they cost a fortune in Hawaii! So while I can still enjoy them while there, I’m not sure I’ll ever be able to afford to eat them by the buckets full or make my triple berry pie any time soon. Ice hockey rinks. Even though I haven’t played in 2 years, Chuck plays weekly and I was hoping to start playing again some day. I haven’t hung up my skates forever but clearly I’m hanging them up for a while now. Also, the ice hockey community is pretty small so I’m going to miss going to the rink and running into old teammates and friends. The variety of food. I love being able to eat Thai one night, Indian the next, Pho the next and so on. I’ve gotten spoiled by the options available outside my doorstep. Location. Its been so nice to be less than a 5 hour drive from: Baltimore, NYC, Philly, Annapolis, Virginia Beach, the Atlantic Ocean, and Pittsburgh and I’ve spent many days at each location over the years. The sheer amount of extra-curricular activities. We have every major sports league here and I’ve made sure to see every one of our major local teams play. We have the Kennedy Center and Wolf Trap for unbelievable arts. There are a ton of museums which are mostly free. The National zoo, the monuments, the White House, the Capital. Jazz clubs, dance clubs, even strip clubs. Sky dive, scuba dive, ski and more. If you want to do it, you can pretty much find it nearby. Of course this list doesn’t mention the biggest thing I’m going to miss: all my family and friends which I’m going to miss greatly. 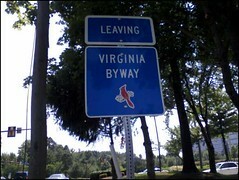 Thanks for the memories, Virginia. Next post: At long last, Aloha from Hawaii!